This is Kelly Clarkson's second book that she wrote for her daughter River Rose Blackstone and also I have not read it but I have heard that is such an amazing book and I hope you guys love it. Enjoy! 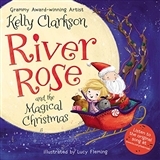 The original Idol, Grammy Award–winning singing sensation Kelly Clarkson, is back with another enchanting picture book inspired by her own daughter, River Rose: River Rose and the Magical Christmas. It’s Christmas Eve, and River Rose wants to stay up all night to hand-deliver a letter to Santa. She can’t wait to finally meet the man in red until . . . Oh no! River Rose and her dog, Joplin, have fallen asleep and been swept off on another magical adventure. This time, they’re off to the North Pole to let Santa know what River Rose really wants for Christmas. This joyous new holiday story perfectly captures the spirit of the season and comes complete with a link for readers to listen to a brand-new, original Christmas song written and performed by Kelly Clarkson herself, available at www.hc.com/riverrose. River Rose’s favorite night was always Christmas Eve. She knew Santa would stop by because she did believe. River Rose and her dog, Joplin, had written him a letter. And they were waiting up for him—hand-delivered would be better.